This is what happens when you connect the high level output of an audio amplifier, to an input designed to be hooked up to an MP3 player or other line level audio source. 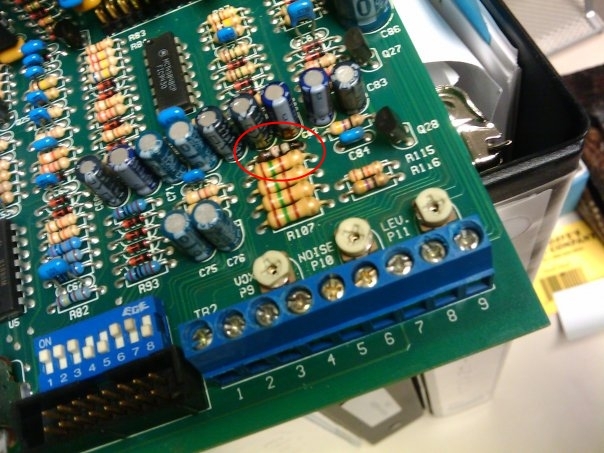 This Aiphone PA amplifier was incorrectly installed by a technician and it made this 1/2W resistor dissipate about 40W. It held up…briefly…but quickly turned into a charred mess. It was somehow managing to pass a terribly distorted signal but didn’t damage any other components. After replacing the resistor on this pictured unit, and another identical one damaged the same way, it was back in service. It’s not always overly aggressive cost engineering that makes things fry. Sometimes it is actually operator error. This entry was posted in Commentary, Hardware and tagged aiphone, amplifier, cost engineering, fried electronics. Bookmark the permalink.